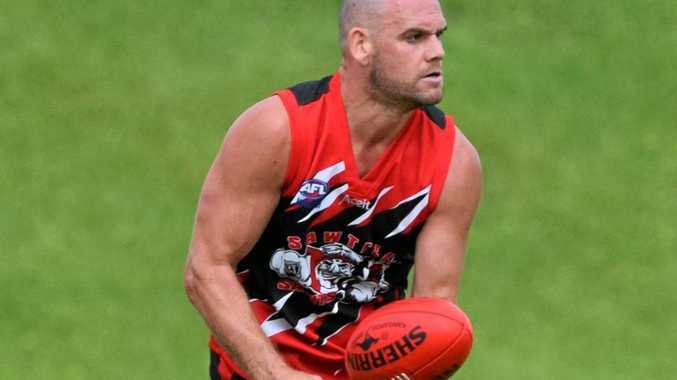 SAWTELL/Toormina's Luke Matthews capped a fine individual season by being announced as the winner of the AFL North Coast's Brian Saville Medal. The local competition's equivalent of the Brownlow Medal, Matthews pipped Grafton's Luke Stanford to win the medal for the second time. Matthews first won the prestigious award in 2010. The result of Saturday night's vote count wasn't known until the final round. With one match to go both Matthews and Stanford were level but the Saints leader polled one vote in his team's final home and away match to claim the prize. Matthews had a tremendous second half of the season, polling votes in each of the last seven matches to claim the medal by the smallest of margins. Although the Saville Medal is an individual award, the winner paid tribute to his team mates for helping him win it. "The boys have been great this season in stepping up to the challenges that were put to them,” Matthews said. Coffs Breakers key forward Fraser Duryea was the leading vote getter for the premiers and finished the count of the umpires' votes in third position. Sawtell/Toormina's Daniel Pritchard was awarded the leading goal kicker trophy.